One of the fiercest debates in Austin concerns the relationship of density to transportation. Existing residents, when they see new development along corridors like Burnet Rd, often experience the negatives of such development: late night bars that release drunken customers at 1 or 2 am, the resulting late-night noise, and the reduced pedestrian safety on residential streets where these customers are parking. Perhaps most palpable - ever worsening traffic congestion. Urbanists I talk to take the long view. The faster you can add new housing and destinations, the faster you can have a transit-oriented city where car use is truly optional. The harder that neighborhoods push back on new development, the longer and more painful will be the transition from a car-oriented to a transit-oriented society. I accept the arguments of both sides on this one. I conceptually agree with urbanists that greater density will reduce car use. Numerous academic studies, and experience of other cities, confirm that. As with any simple principle, however, the devil’s in the details. Some places on Burnet Rd are far better suited to reducing car trips than others. The degree to which CodeNext accounts for context when deploying the new zoning will help determine just how painful the transition is from a car-based to transit-based society. To understand how context affects car use, consider Portland, Oregon, a city that has been doing transit-oriented development since the 1970s. It’s encouraging to see that residents of apartments near light rail stations in Downtown Portland barely drive. Per capita car use for such residents is less than one trip per day. But residents of apartments near light rail in suburban Portland (six miles from the city center) drive 5-6 times a day. That’s about the national average. The take-away is that transit, in and of itself, has a fairly modest impact on reduced car use. Robert Cervero, the author of the traffic study cited above, in an earlier study observed that residents within a ½ mile radius of a light rail station used transit for only about 12% of their trips. For buses on Burnet, that car-reducing potential might be far less. Other factors than transit probably have a bigger impact on car use. This article posits that lack of parking is a major factor. But ultimately, you can’t get people out of cars without making it easy to walk or bike to lots of destinations. Denser places need to have more destinations within walking distance. In Downtown, the number of destinations within walking distance is high. That’s due to geometry – Downtown and its destinations are arranged two-dimensionally, on a highly walkable street grid, in every direction. 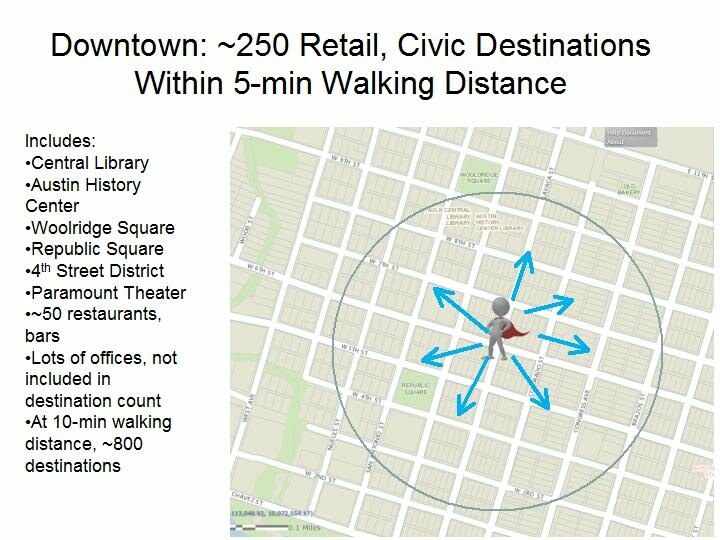 For a given location in Downtown Austin, there are as many as 250 potential destinations within a five minute walk. If you walk 10 minutes, that number leaps to 800. 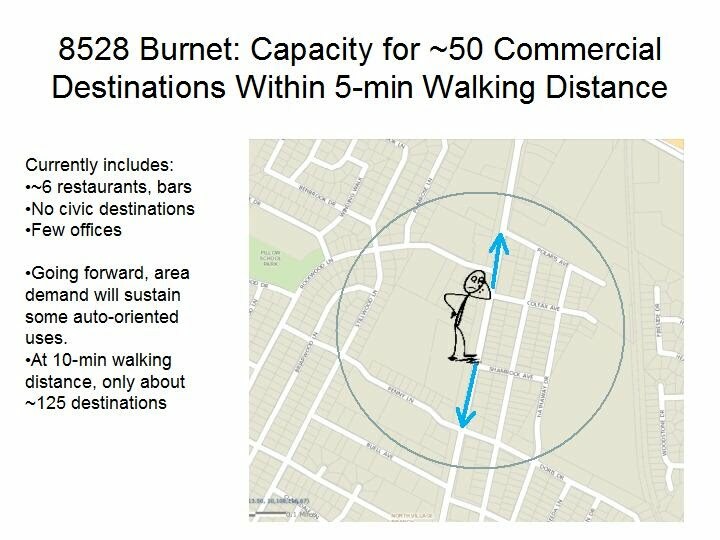 The linear arrangement of a suburban transit corridor like Burnet greatly restricts how many walkable destinations you can have at a given point. Commercial areas near major intersections, like Northcross, tend to have the most destinations. They have the greatest car trip-reducing potential. Conversely, some places along the corridor have far fewer potential destinations within walking distance. At the Gordon Automotive site on Burnet a quarter mile north of Ohlen, which City Council last year upzoned to allow large apartments (MF6), there are just 50 potential destinations within a five minute walk. Walk 10 minutes, and it’s still just 125. The limited potential for more destinations at certain points along the corridor also makes those places a lower priority for expensive pedestrian infrastructure, like plazas, trails, pocket parks. Those amenities need to go where they will get the biggest car-trip-reducing bang for the buck – at village centers arranged around the rapid bus stations. To recap: even if we add new housing, at many points along Burnet the likely car use per resident may still be near suburban levels, for 20 or 30 years. Number of car trips is just one way to evaluate car use. The other metric is how many miles a person has to drive per trip. By this metric, even poorly supported locations along transit corridors result in fewer vehicle miles traveled than places in the distant suburbs. So from an environmental (and long-term affordable housing) standpoint, there’s still an argument to increase density at such sub-par locations. But the local congestion impact from such density will be higher. The CodeNext Opticos consulting team recognized this in their Diagnosis report. For places farther from transit nodes, the consultants proposed low-impact development categories, like live-work. City staff are targeting end of this year to roll out an initial ‘mapping’ that shows, citywide, how new CodeNext zoning categories will replace the old zoning categories. With staff no longer intending to do a Burnet-Anderson Corridor Plan, presumably there will be no formal account of local priorities when the new zoning is deployed. Any accounting for local priorities, and many Imagine Austin priorities as well, would have to be embedded in the CodeNext mapping rules themselves. Such a mapping could go two ways. A simplistic translation of new zoning categories to old categories, as implied by the term ‘mapping,’ perhaps determined by the maximum allowed height of the existing zoning, could not possibly optimize Imagine Austin goals. We would get “compact but not connected”, as some on staff describe the random, transportation-inefficient development pattern that has emerged along S Lamar. Such a system of rules would also lay the groundwork for a rational, predictable zoning amendment process going forward. CodeNext is a once-in-a-lifetime shot to solve a lot of intractable problems. On this one occasion, here’s hoping staff will be bold.